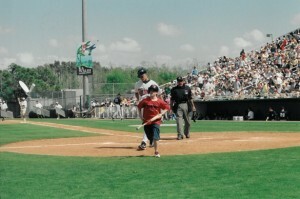 Up to this point in my life – 24 years and counting – being the bat boy for the Minnesota Twins during Spring Training of the 2003 season is by far the coolest thing I’ve done. After reading that opening sentence you’re probably thinking: “Whoa, no way! How did you get to do that?” Luck, that’s how, plus the fact that one of my uncle’s has this (rare but fortunate) knack for meeting/befriending famous professional athletes – the majority of these meetings or friendships coming by way of his former occupation. The Minnesota Twins’ Spring Training facility is located in Ft. Myers, Florida, where my Uncle Kerry spent roughly 20 years as a local police officer. And as such, my uncle got to work security for many of the preseason baseball games. 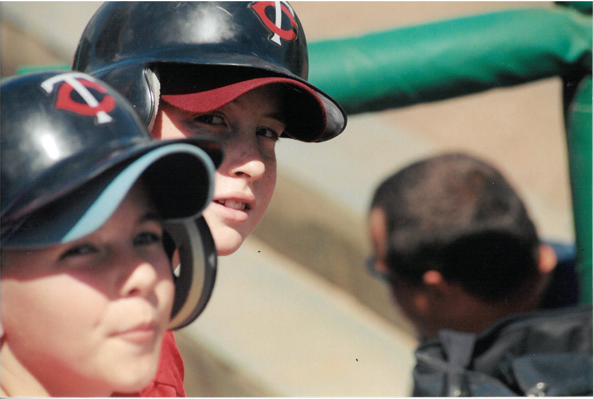 So he pulled a few strings and my cousin and I got the chance to play bat boy or the Minnesota Twins (this is why Uncle Kerry is a perennial favorite to win the Uncle of the Year Award). There were a lot of exciting things to remember about that trip, but there’s one incident in particular that sticks out. Here’s how I recall that event nearly 13 years later. As you might’ve guessed from the title, this story is about A.J. 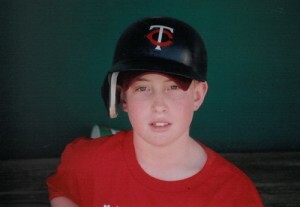 Pierzynski – the Twins’ catcher at the time – and two large buckets of Bazooka bubble gum (which we’ll get to later). First off – and it pains me to say this – A.J. Pierzynski is an extremely talented baseball player who’s performed consistently well over his 18-year career. No one has ever questioned his physical skill set and you’d be hard pressed to find a better hitter at the catcher position. Objectively, he’s a very good player, got it? Good, moving on. Secondly (and more importantly for the sake of this story), A.J. Pierzynski is undeniably one of baseball’s biggest jerks. No seriously, the notion that Pierzynski has been notoriously unlikeable throughout his career – in the eyes of both opposing players and his own teammates – is an irrefutable fact. He’s a real-life embodiment of all the worst TV bullies of your childhood. If Buzz McCallister from “Home Alone” and Harley Keiner from “Boy Meets World” were to team up with the O’Doyle family from “Billy Madison” to make a super-athletic hybrid bully, its name would A.J. Pierzynski. You’re probably thinking: “Jeeze, Blake, that’s awfully harsh. What did Pierzynski ever do to you? And what about that part with the Bazooka bubble gum?” Funny you should ask. If for some reason you’re unfamiliar with the duties of a typical bat boy, here are a few of the basic ground rules: when a batter from your team completes an at bat with something other than a strikeout, whether by reaching base safely via walk or hit, or by being put out, it is the job of the bat boy (in this case an 11 year-old me) to then retrieve the recently discarded bat and return it to its proper place in the dugout. This is the bat boy’s most basic responsibility: bat retrieval and appropriate arrangement of said bat. 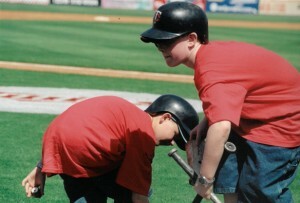 Aside from that, say before the game begins, bat boys are often asked to prepare the on-deck circle, which means finding and arranging various types of pine tar applicants and bat weights (often referred to as “donuts”). But as I soon discovered, thanks to the insolence of our antagonist Mr. Pierzynski, the primary job of a Major League bat boy is a two-step process involving the one item that certain Major Leaguers (apparently) cannot live without: Bazooka bubble gum – you remember, the chewing gum which featured the cartoon character “Bazooka Joe”, and who’s catchy tune is almost certainly ringing in your head as you read this very sentence. Step one is the easy part: procure two large buckets of the bubble gum and bring them from the clubhouse to the dugout. Step two is not nearly as easy: after transporting the gum buckets into the dugout, be sure to place them exactly where Mr. Pierzynski would like them to be, even if someone else (say, one of the Twins’ Managers for instance) instructs you to put them elsewhere. If step two is not executed to those exact standards, you may find yourself on the wrong end of a rather unpleasant verbal onslaught, barked from the opposite end of the dugout by a large, barrel-chested catcher with a very Polish-sounding last name. To put it directly, A.J. Pierzynski yelled at the 11 year old version of me for the misplacement of two bubble gum buckets. Show me an A.J. Pierzynski fan – one who’s not directly related to him – and I’ll show you a liar …or a bully …or a lying bully. Not typically a grudge-holder, in this case I most certainly am, and maybe that’s unfair to Pierzynski. After all, anyone with built-up angst and a keyboard can denigrate the character of someone they’re likely to never see again. And if I’m being entirely truthful with myself, there’s a very good chance that my memory of these events has become exaggerated over time. In fact, there’s one specific incident which undoubtedly worsened my opinion of Pierzynski: the infamous 2006 brawl between Pierzynski (then a member of the White Sox) and Michael Barrett (at the time my favorite player on my favorite team, the Cubs). The brawl resembled barbaric pugilism rather than virtuous baseball. Both parties were wrong in this case, and in no way were their actions justifiable. And just so we’re clear, Barrett carried a similar reputation to that of Pierzynski, which is to say that he never shied away from confrontation, and at times was often the source. As previously stated, Pierzynski is a world-class ballplayer, one who unquestionably enjoyed a lengthier and more successful career than Michael Barrett. All things considered, Pierzynski probably deserves another chance, at least in terms of my unfavorable memory. But in this context, I’m sticking to my long-held views regarding my bat boy experience because: a) that’s how I remember it, and b) the image of an 11 year-old redhead being intimidated by a goliath-like athlete makes for a pretty entertaining story.